The Atlas is an iconic Inner Sphere Assault Mech well recognized by Battletech fans for generations. With it's awe-inspiring Weapons, and extremely tough Armor, the Atlas has built itself a reputation as one of the most fearsome Inner Sphere Mechs available. With a surprisingly low price tag for a 100 ton Mech, the Atlas is relatively easy to field compared to its better-armed cousins, yet raw firepower is hardly lacking in any Atlas variant. Furthermore, the primary feature of the Atlas isn't the weaponry itself - it is the incredible longevity provided by extremely thick armor, coupled with the use of the standard engine, netting it an additional survivability bonus. This allows the Atlas to take inordinate amounts of punishment before succumbing to enemy fire, and makes the Atlas an ideal choice for defending positions from enemy attack. Furthermore, the Atlas is able to carry a wide array of electronics, allowing it to fill a support role while it takes punishment for the rest of its team. The Atlas Prime is built towards command and control of large areas of the Map with its heavy, long-range firepower. 2 ERPPCs on the arms and twin LRM5s give it firepower at long range, while a Gauss Rifle provides a powerful punch at any range. If an enemy approaches too close to use the LRMs, the ERMLs come into the fight to keep the pressure on. A single LAMS protects the Atlas Prime from enemy missile fire while it supports its allies from afar. Single B-Pod helps fending off enemy Battle Armor, 4 DHS are somewhat enough to keep heat in check, so long as the pilot doesn't lean too heavily on the PPCs. The Atlas A, dubbed "Mr. Bubbles", is armed with 3 RAC5, giving it incredible damage-per-second against enemy targets. This style of combat is very suited for the Atlas, as its heavy armor allows it to endure the return fire such an exposed method of combat brings with it, a luxury many other DPS based Mechs and tanks do not have. The twin DSRM4s require a different lead then the RACs, and thus are best used while your rotary cannons cool down or reload to screen yourself behind their exhaust and to shake the enemy, reducing the effectiveness of its counterstrike. They can also finish off heavily damaged targets in a pinch given their strong damage output. The biggest downside to this variant is its short effective range of only around 250 - 300m, especially since almost every other asset is faster then the Atlas. 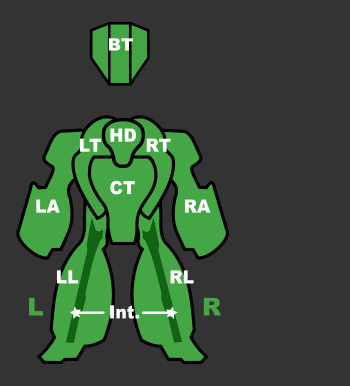 The RACs can be used further out, but the spread and damage falloff prevents them from dealing significant damage behind 500m, and the DSRMs alone are not enough to threaten anything bigger then a light Mech. Furthermore, this variant lacks LAMS to dissuade enemy missile fire, leaving the pilot vulnerable to screen shake from retaliatory fire, meaning that pilots should carefully approach their targets under the cover of GECM rather than march across the open field to fight. 8 tons of extra ammo are enough to keep all its weapons firing for a while, but caution must still be applied, because the Atlas is too slow to retreat should its ammo run out during combat. The B Variant is the only other mech armed with a Improved Heavy Gauss, giving it serious firepower at medium- to short-range. This terrifying weapon is supported by two PPCs, complimenting the iHGauss' 800m range bracket. For even more close-range firepower, this variant is equipped with two SRM4 launchers. This leaves the Atlas B with excellent mid- and close-range firepower. Its 5 DHS are sufficient to handle almost continuous firing of the IS PPCs. A good tactic is to chain fire them to maximize enemy screen shake while the Improved Heavy Gauss reloads between shots. AECM makes this range bracket ideal for this Atlas, allowing it to provide an umbrella of radar protection to allies while they march toward the enemy. However, the lack of LAMS means that this Atlas is quite vulnerable to enemy missile fire while it moves in - such coverage would need to be provided by friendly units instead. "The Big Bully" is designed to be a close-range powerhouse. Mounting an array of short range weaponry consisting of 4 small pulse laserss, twin dual SSRM6s launchers, and a massive LBX20, the Atlas C has the capacity to pummel anything that gets within 300m into oblivion in short order. 6 DHS easily allow the Mechwarrior to continuously fire all weapons. GECM hides it from enemy radars and a single LAMS protects it from missiles. Overall, this variant's greatest strength is its ultimate weakness - outside of its ~300m range bracket, it is entirely useless, and being one of the slowest assets in the game, this leaves the Atlas C ill-suited choice for offensive maneuvers that expose it to enemy fire for long periods of time where it has no option to fight back. This leaves The Big Bully an option for defensive engagements, where it can force a close-range engagement from advancing enemy units, and where its extra armor and LAMS can keep it in massive firefights for extended periods of time. As such, the Atlas C is a perfect choice for static defensive duties, but little else beyond that. An homage to the classic AS7-D Atlas, the Atlas D is an economy solution. Snubbing advanced weaponry and electronics for older, cheaper tech, the Atlas D provides players with the chance to field the heavily-armored Atlas chassis relatively early compared to other Assault Mechs. Its firepower is primarily brought to bear at close range, with an AC20 being the main damage-dealer, while a SRM6 exploits weakened sections. 4 Medium Beam Lasers provide some support fire at slightly further ranges, and a single LRM20 allows this Atlas to reach out and hit enemies at long-range, at once allowing it to soften enemies up while moving into closer ranges and also giving it the ability to retaliate against long-range snipers that outrun it. 4 free tons of ammo allow the pilot to have two AC20 reloads and two LRM l reloads for extended time in combat. Lacking any electronics except for the LAMS to speak of leaves this Atlas inferior in the electronics warfare department, though this also helps keep costs down. While the Atlas D may lack the raw firepower compared to some Atlas variants and the extensive electronics packages of others, the Atlas D is still a powerful asset in the right hands, and the low price tag allows it to get into more hands. The Atlas Variant E, officially dubbed the "Master & Commander" (and sometimes lovingly called the "Steiner scout Mech" by players) is outfitted with the most sophisticated electronics available. BHP gives it enormous sensor range, an advantage it can share with its comrades due to the C3 computer, while GECM keeps it hidden from detection. Dual LAMS offer itself and nearby allies good protection from missile barrages, and the iNARC enables it to select targets for friendly missile artillery. The armament of 2 ERLBLs and 2 LRM15s give it long range firepower similar to most long-range IS heavy Mechs and 2 ERMBL add a little extra firepower at medium ranges. Overall, it cannot expect to defeat Clan heavy and assault Mechs on its own. But, as the anchor that keeps the forces rallied, single combat is not amongst its tasks. It is supposed to be the leader of a pack, giving them cover, giving them information, giving them protection, and giving them their targets to slay. 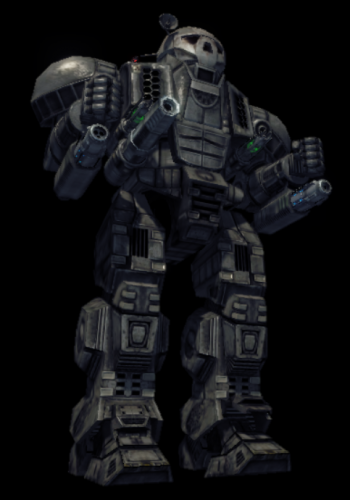 A unique variant, the Atlas F heavily relies on the mechwarrior's ability to use the four heavy hitting Thunderbolt missile launchers as effectively as possible. Their lock on range is 700m but will still do massive damage to targets up to 1000m away. They do have a rather slow turning radius, thus are quite ineffective against agile targets. Instead, mechwarriors should unleash the pinpoint accuracy of the long range three Large Pulse Lasers against said targets. Furthermore, mastering the ability to dumbfire the Thunderbolt missiles at brawling range is somewhat difficult but oh so rewarding when accomplished successfully. Careful maneuvering is required for the F to get into position, trying to get a down the throat or up the kilt shot that'll maximize the chance of the Tbolts hitting. This is far easier against slower targets while quick mechs can dodge out of the way relatively easily unless at close range. 2 free tons of ammo are insufficient for longer combat engagements. The Atlas F lacks any defensive electronics equipment, so mechwarriors should not be caught out in the open against enemy missile boats or dedicated long range snipers. Being the most expensive Atlas, the G is well worth the cost as a brutal close in warrior. Any enemy mechs that are on the receiving end of its alpha strike of triple autocannons consisting of an UAC20 and twin UAC10s, plus two SRM2s and a pair of SBLs can attest to its awesome firepower that shreds opponents in mere seconds. It'll do this under the stealthy cover of its GECM, significantly reducing its radar signature. Atlas G pilots often turn off their radar to maximize the chance of catching an enemy by surprise. Twin laser anti-missile systems give it an umbrella of protection against missile onslaughts while this lumbering beast closes the range to its prey. Five DHS are sufficient for extended autocannon fire while 3 free tons of ammo are just enough for an average battle time period. Though, its slow movement must be accounted for thus wise pilots should always be situationally aware of the ebb and flow of the battle to not get over-extended and swarmed by the enemy. Finally, the Atlas G is the only variant that has a lighter XL engine allowing it to carry more heavy firepower at the cost of its center torso armor taking twice the transfer damage from a destroyed left or right torso. Faced by said situations, a clever mechwarrior will swing away his damaged side away from incoming fire as much as possible. Before version 0.3.0, the Atlas was referred to as a swimming pool or glass bulb. The top part of the head was made entirely of glass, appearing for units or BA above it as an empty space, often leading to surprise when a direct hit on the pilot didn't result in a kill. In the 0.3.0 release, a metal helmet-like cover was added to the head, changing the appearance of the unit, though still not giving it the instantly recognizable skull-head/death's mask due to technical limitations. A head modeled entirely as a skull would make it nearly impossible to pilot the unit, due to obscured vision. "A ’Mech as powerful as possible, as impenetrable as possible, and as ugly and foreboding as conceivable, so that fear itself will be our ally." 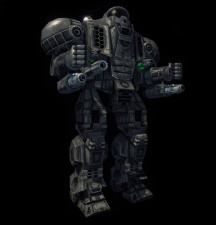 The Atlas, or "Death's Head" as it was nicknamed by MechWarriors, is a 100 ton Assault 'Mech built in the period leading up to the fall of the Star League. The first appearance of this 'Mech on the battlefield was during the Amaris Civil War, as the forces of General Kerensky sought to retake Terra and end the rule of Stefan the Usurper. When Kerensky sounded the call that was to become the Exodus, most of the Atlas pilots in the SLDF refused to respond, and thus the 'Mech remained in the Inner Sphere where it would go on to many years of glory. Originally the Atlas was one of the first units to mount the AC20, supported by a uniquely configured LRM20. Utilizing a faster than usual reload mechanism, the launcher fired 20 missiles from five tubes in the time a traditional LRM20 launcher would shoot a single salvo and reload. Additional support weapons were 4 Medium Lasers and a single SRM6 launcher. A small dish antenna mounted on the Atlas' head allowed communication with orbital units or satellites, and it could be folded inside of head. Until the rediscovery of ferro-fibrous armor in the mid-3030s, the Atlas was the most heavily armored 'Mech to ever walk the battlefield. This page was last edited on 29 January 2019, at 21:36.